The Second Shift by Arlie Hochschild explores the dichotomy faced by women to incorporate family life into career life. This is a topic suggestion on The Second Shift from Paper Masters. Use this topic or order a custom research paper, written exactly how you need it to be. 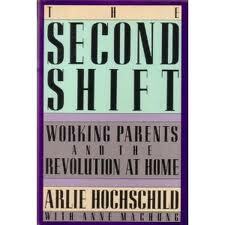 The Second Shift by Arlie Hochschild explores the dichotomy faced by women to incorporate family life into career life. Although Hochschild notes that her interest in the subject stems from her own personal experiences with balancing a career and a family life, her interviews with families confirm that even though women have been struggling for more than three decades to resolve the challenges faced by career and family, few have found the balance necessary to change the fundamental social structures and stereotypes that have been hegemonized into society. As such, organizations are still focused on the dominant male stereotype and women are must contend with these unwritten codes that prevent them from successfully integrating career and family life. Both economic and social discourse needs to be altered to support marriage, family and child rearing. This text should be read by any individual considering marriage. The realities facing couples attempting to raise families in modern society, it forces the reader to examine his or her own life and determine what they will do when faced with the same circumstances. After reading the personal stories of the families presented in Hochschild’s text, it becomes clear that while many of the stories are compelling, the biography of Barbara and John Livingston’s lives was perhaps the most compelling. This is because, in this story, Hochschild was able to show how the demands of both family and career can ruin the bond between two people who truly love one another. Throughout the course of her interview with the couple, Hochschild notes that both Barbara and John display all of the normal affections that a couple in love share with one another. Yet despite these affections, there were still problems in the marriage. Attempting to get at the heart of the problem, Hochschild notes that Barbara and John had, what appeared to be, a good marriage on the outside. Neither was prone to fight with one another and both appeared to equally share the responsibilities of housework and childcare. As such, Hochschild is forced to probe deeper into the lives of the Livingston’s to determine what has promulgated so much dissatisfaction between the two. Through her analysis, Hochschild is able to determine that the birth of the couple’s daughter Cary is what served as the basis for the couple’s problems. Both Barbara and John’s roles changed and neither knew how to navigate these changes and communicate their feelings. Family Interview - The family interview research paper is aimed at exploring the family experience with illness or transition, the family challenges with managing, and any nursing care that they found helpful. Working Two Jobs Research Papers go into the physical and mental strains that it may cause, and what this stress could lead to. Family Diversity Research Papers discuss the different family structures from 1900-2000. Paper Masters writes custom research papers on The Second Shift and discusses a novel by Arlie Hochschild about the issues of social and cultural norms that prevent women from advancing in society.